We all love Spidey. Well, forget about him. This is his adversary’s time to shine! In the past Spider-Man movies, we saw several reincarnations of the Green Goblin. The superhero has a long list of foes that have been brought to life in the movies but now it is Venom’s turn for a second chance. We saw him first in Sam Raimi’s Spider-Man Trilogy in Spider-Man 3. Topher Grace did a pretty good impression of the alien parasite. About a decade later, the anti-superhero character is returning to the big screen thanks to Tom Hardy. Are you ready to see Venom despite the amount of hate that it is receiving online? Well, we loved it and you should see why! Going into the advanced screening at the IMAX Theatre in SM Megamall, I was riddled with worries that it was going to be another Fantastic Four or worse, Marvel’s Suicide Squad. I’d hate to be proven wrong on a typical day but this is one of those rare moments that I loved being proven wrong. Venom, both the character and the film, is wickedly hilarious! Think of it as the punk cousin of the Marvel Cinematic Universe. Truth be told, the first few minutes of the movie were off to a rocky start. It fueled my fears that it was going to be a bad one. International early screenings of the film affected my judgement of Venom. Fans and non-fans are claiming it to be among the worst superhero movies ever made. Yes, alongside Halle Berry’s Catwoman. I gotta admit that those feedback dampened my excitement for this one. Also, it could be the pop culture geek in me knowing the production drama behind the film. To much of my surprise, Venom, crushed my worries about it sucking. The odd humor at the start missed so bad but the ones that came soon after were a hit. 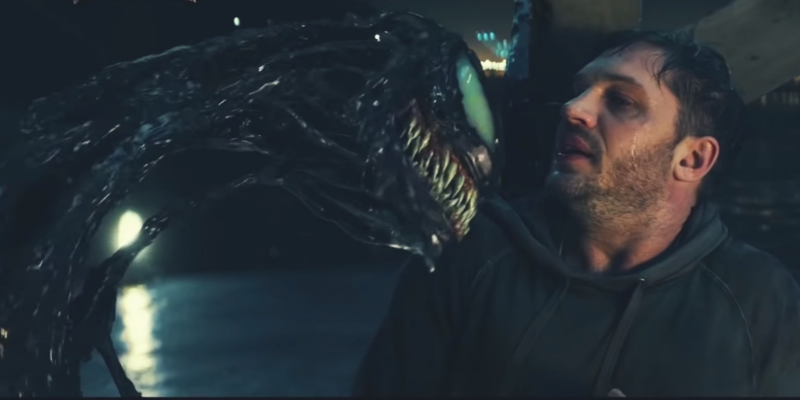 Tom Hardy did an exceptional job in portraying Eddie Brock and Venom. I guess that’s part of the success of the film- the charismatic connection between these two characters. These two losers. As the tagline says, “The world has enough superheroes.” And that the movie has proven. Let us look back at the villain films where they tried to spin their narrative to make them the heroes. We have Suicide Squad, Catwoman, and X-Men Apocalypse. What do they have in common? They all sucked. Yep, there’s no point in sugar coating things. There was a real fear that the film will follow such plot and thank heavens, they did not! Venom is the anti-hero that charmed his way to my heart. Behind his deep menacing voice is a sarcastic malevolent creature that bites people’s head off for fun. When you have a practically undestructable symbiote roaming around the planet, how would you create conflict? Well, introduce one of its own and have them fight each other. It may sound ridiculous, well it is, but it was exciting! Think of Iron Man vs Iron Monger or Hulk vs The Abomination, Venom faced Carlton Drake’s version of Venom. The fight for power and dominance in this was a sight to behold. There was a bit sense of depth in the intention which elevated the overall ridiculousness of the film. Venom might have saved the earth in the process but his intention was not that of a superhero. Venom is far from the greatness of the Marvel Cinematic Univese but it is unfair to compare them because each of them has an identity of their own. Think of a family reunion where everyone is dressed properly and prim then there is that one punk rebellious cousin who will arrive late to the party. That is Venom. It is fun, crazy, and wild. Yes, I enjoyed it so much that I am craving for more!